….if you’ve ever tried to spray fish oil. Add in several other ingredients, and you have a recipe for a sprayer jam. 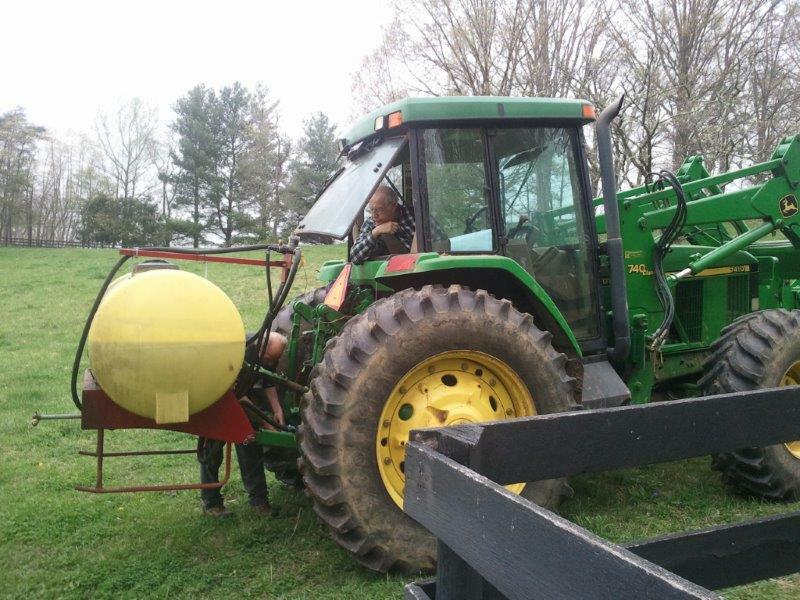 We’re fortunate to have a neighbor—Ira McDowell—who is a veteran tractor mechanic as well as an all-around handyman. 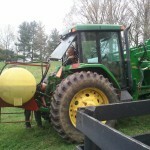 That’s Ira unclogging the line from the outlet of the PTO pump while I “supervise”. The material we’re spraying is a combination of fish oil and compost tea laced with microbes, calcium and phosphate. It’s an expensive mixture and we’re trying it on two test pastures. The hope is that this potent mixture…after several applications…will fix our pastures with a fertility profile they haven’t seen in hundreds of years. It’s the kind of experimental things we enjoy trying here at Thistle Hill. Sometimes they work! When we irrigated last year we added compost tea to the water–easiest way to cover a big area. To soon to tell what impact it had, and this year hope to implement keyline irrigation on our hills and illiminate the need for diesel to irrigate.